Color blindness is weird. It affects about one in 12 men, and one in 200 women, impacting about 5 percent of the global population. Most people don't discover it until they're adults. What do you do, how must you feel, when you find your way of seeing the world is different from others'? In Brazil, color blindness affects about 8 million people. 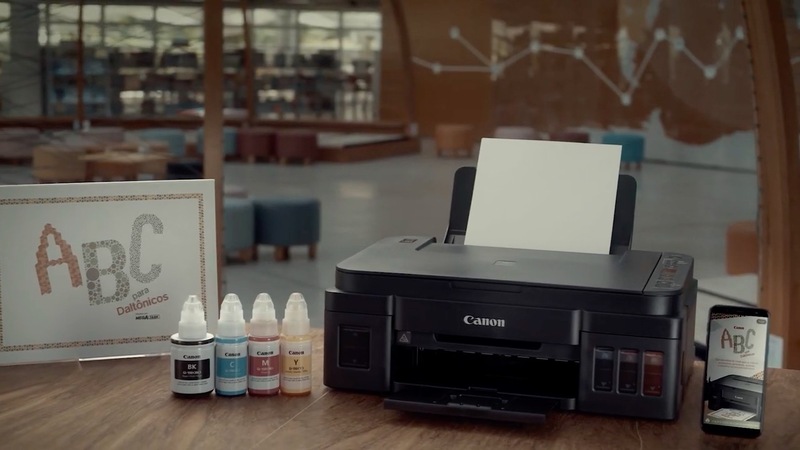 To help identify the condition while people are young, Canon partnered with Dentsu São Paulo to promote its Mega Tank printer in a manner most unusual. The "ABC ColorBlind Book" uses the print test feature to print an entire book of ABCs for children. The color blindness test is slyly built in. The associated video introduces viewers to graffiti artist Marcio Reis, who discovered he was color blind when a teacher conducted a color blindness test. "Children were bullying me for not knowing what color it was, or for having painted a picture with the wrong color. At home I was also very repressed. But it's because they did not understand what it was. Me neither," Reis recounts. "Early diagnosis helps a lot in the inclusion of children in school and at home," says color vision specialist Maristela Stoianov. Given time to adapt early, "people affected by color blindness are able to create an adjustment mechanism like any other that has a disability. Usually, the colorblind are amazing"—they find workarounds and unexpected color combinations, turning what could be considered a bug into a creative feature. Reis is one such example. "I've been doing graffiti for 20 years, and my story has always been one of overcoming. I think I used disability as inspiration," he says. The "ABC ColorBlind Book" is based on the Ishihara Test, developed in 1917 to gauge red-green color perception variances from the norm. Canon's version, created by a triumvirate of art directors, is more modern and playful, and is available when you download an associated smartphone app. If any children have trouble with the test, parents or teachers are encouraged to send them to an ophthalmologist. "This is an opportunity to help recognize the problem in children ... in a playful way," says Tânia Abe, Canon Brazil's consumer marketing manager. "These are works that inspire our daily lives here at Canon." Bonus! Every page tests your printer, leveraging the nuances of the Mega Tank's ink and granular capabilities—a subtle message that hopefully won't go unremarked.